Great Britain's Rebecca Adlington swam a time of 8:14.10 to win the Olympic 800 m freestyle race and broke Janet Evans' existing world record. Rebecca's stroke mechanics were recognized as being exceptional. To satisfy that attribution, the Swimming Science Journal features two sections of the remarkable swim. These analyses give clear indications of how the swimmer uses each arm under a seemingly high degree of fatigue. Each frame in this analysis that features the left arm action is 0.1 seconds apart. Frame #1 illustrates the length of the effective underwater pull of the swimmer. The left arm pushes long back while the fully forward-stretched right arm already has the wrist flexed so the hand applies some, although small, force to the water. The milky water around the left hand is the turbulent water (which diffuses the light) remaining from the total-arm's drag resistance pocket. In Frames #2 through #4, the right arm bends at the wrist and elbow building propulsive pressure along the arm. Abduction of the upper arm commences in Frame #3 and accelerates in Frames #4 through #8 where the initial abduction finishes as adduction of the upper arm. Frames #3 and #10 illustrate the extremes of the rolling actions of the hips and shoulders. It seems the hips travel through approximately ±45° whereas the shoulders roll slightly more. Although some swimming "theorists" claim that modern crawl stroke swimmers roll seemingly little, that is not the case with this greatest-of-all-time 800 m freestyler. The perspective provided of the left arm shows clearly the full repositioning of the forearm-hand as far in front of the body as possible. 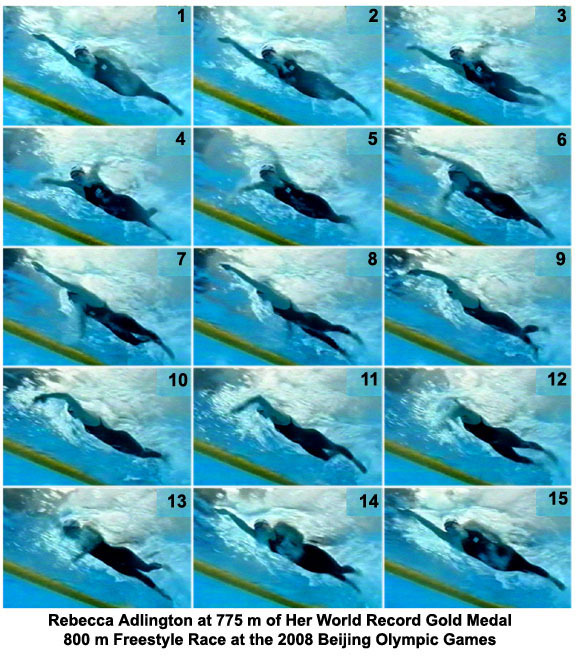 However, as occurred with Rebecca Adlington's right arm, the positioning of the forearm is achieved after some abduction (acceleration of the upper arm) has occurred. The overlapping of those two segments of this action puts paid to the concept of an "early vertical forearm" as an isolated movement. The power of Rebecca Adlington's stroke is visible in the images of this analysis. Frame #12 shows the large pocket of drag turbulence obscuring the lower arm and hand. Frame #13 clearly shows turbulence coming off the upper arm verifying that the whole arm and hand is the propelling surface through the most powerful section (accelerating abduction and adduction) of the stroke. Once adduction decelerates (Frame #14) the upper arm no longer provides propulsion, but the lower arm and hand continue to do so very effectively. The swimmer's streamline throughout the whole stroke is excellent. The swimmer performed a six-beat kick for the whole race. That is uncommon for top distance swimmers. However, with Rebecca Adlington's very long effective stroke, there is time to fit in six small, mostly similar kicks. Not only do they keep her streamlined, but they allow her to perform more effectively with her arms at the stroke movement extremes. There would be no benefit and only pitfalls if this swimmer tried to kick harder during a race. Not only is the kick non-propulsive, it is more fatiguing the harder it is performed, and it takes longer to complete the six-kick cycle (which could cause an unproductive delay in the arm-stroke cycle to allow all the kicks to be completed). It would be unwise for a coach to teach distance swimmers to kick six-beats if their strokes were not long enough to accommodate them and/or there was an emphasis on "getting propulsion" out of the kicks. There are frames in this analysis that show the leg action being counter-productive to propulsion. In Frame #9, there is slight dorsi-flexion of the previously plantar-flexed ankle. In this position, the foot increases resistance and would contribute to slowing the swimmer. Fortunately, the time that the resistance exists is very short. Frame #12 shows the left leg being raised preparatory to kicking. From the mid-thigh to the toes, the leg is slightly obscured by drag turbulence that follows the rise. That too would slow the swimmer. Any drag pocket that is formed by the arms or legs has to be on the forward side of the swimmer to produce propulsive forces. Most of the forces of the legs are almost completely vertical performing the essential function of counterbalancing the vertical movements of the propulsive arms. If there was any slightly propulsive action of the legs, it would be very brief and would be negated by the counter-productive forces of the legs at other times. The above features describe some of the reasons why Rebecca Adlington is a new model for distance-swimming, but not the only model.